by David P. Gushee and Colin Holtz. Brazos Press (Ada, Michigan, 2018). “Moral Leadership for a Divided Age” is an inspiring read and provides food for thought on 14 recognizable leaders who have made an impact on the world stage. Authors David P. Gushee and Colin Holtz follow a pattern where each chapter gives an overview of the historical context in which this leader lived and the early life of the individual, then describes the moral decisions that secured their place in history as leaders worthy of admiration. St. Teresa of Kolkata, St. John Paul II and St. Oscar Romero are three moral leaders that are featured and the authors, who are Protestant, present an insightful and fair depiction of their moral leadership. A martyr who was canonized Oct. 14, 2018, Archbishop Romero is perhaps the most controversial of the Catholic figures due to his theology on how to best deal with the government while serving the poor, which conflicted with Rome’s directives to seek a better relationship with the government. The authors write, “Oscar Romero’s life, like Mother Teresa’s, calls all of us to greater compassion and action on behalf of the global poor. The two represent different models of how to respond to extreme poverty.” The leadership lessons derived from Archbishop Romero’s life are: It’s never too late to change, practice self-examination, evaluate structures, develop communication, and listening skills and responsibility changes you. Moral leadership is not the possession of religious leaders alone and the book looks thoughtfully at leaders who have divergent views on the Judeo-Christian God and draw out the moral leadership qualities that are as important as ever in our culture where the ideas of what constitutes what is “moral” are constantly battered about. The summary of leadership lessons and discussion questions make this a great book for the classroom and book groups. 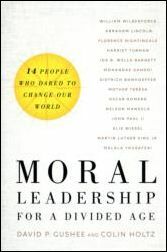 Exploring the moral leadership traits of figures such as Abraham Lincoln, Elie Wiesel, Dietrich Bonhoeffer and Harriet Tubman make this a wonderful primer for young people who are being formed academically but often in need of virtue and character education. These stories will inspire and inform. Wright is principal and director of discipleship at Koinonia Academy in Plainfield, New Jersey.